Chicago boasts one of the country’s broadest spectrums when it comes to choice of cuisine – whether it be by type of cuisine, price, ambiance, you name it, Chicago can satisfy just about any culinary craving. The eateries around town that are considered “expensive” can still be enjoyed by any man with some careful selection of menu items along with attention to the time of day he chooses to dine. 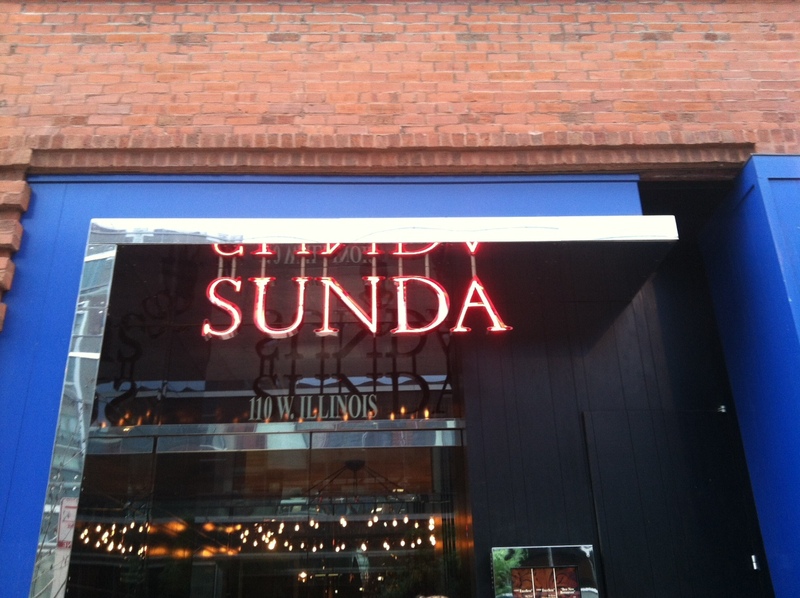 Sunda, for example, is often difficult to get into just about any night of the week. Their food is considered pricey Asian influenced cuisine, and I know many folks who haven’t tried it out because their perception is that it’s out of their price range and way too “trendy” – this doesn’t have to be the case. Share everything. That’s our mantra. The best way to further your dining experience is to try more items. So I say share whenever you’re with others who are equally down with that. 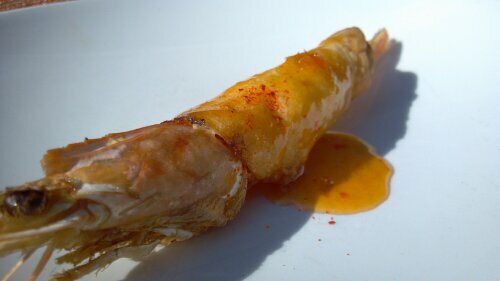 Head-on Prawn Rangoon. We were intrigued and decided to satisfy our curiosity by ordering this as our first course. Unlike other Rangoon, we had no idea what to expect as far as the presentation was concerned. When the course arrived we were pleased. 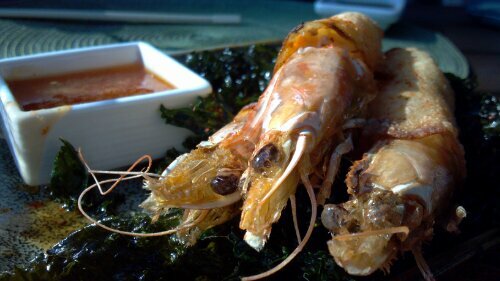 Three extremely large – I’d imagine size U 4/6 (4-6 in a pound) – prawns received the royal treatment. 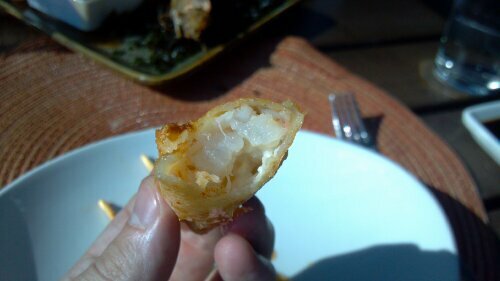 Stuffed with cream cheese and fresh crab meat, they are encased in a light wonton wrapping and fried with the head on. Exceptional. If you want to enjoy Rangoon anywhere, this would be one of two places I would now recommend. As some know, the first, Friendship Chinese, is the reigning champ of Crab Rangoon in our city. Yes, eat the head. It’s delicious. Crunchy, savory, salty. Just forget that it’s a head if that helps. The body was carefully cooked, maybe poached, then wrapped in a light fluffy cream cheese mixture with fresh crab meat. The wonton was crispy and the accompanying sauce sweet and a touch spicy. A great rendition of a traditional dish. Though not inexpensive at $18, shrimp this large aren’t cheap and the labor involved cannot be ignored. Soup is great. 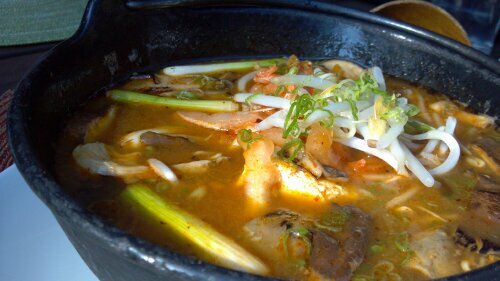 Soup at Asian restaurants is some of the best. Korean, Chinese, Japanese, Taiwanese – the sheer variety is extensive even within each of these unique cultures. The Kimchee Soup on the menu at Sunda is a spicy, zesty, rich soup that features large chunks of slow braised crispy pork belly resting atop a mound of noodles, kimchee, tofu, bok choy, sprouts and scallions. All fresh, all cooked perfectly and extremely complementary of one another. 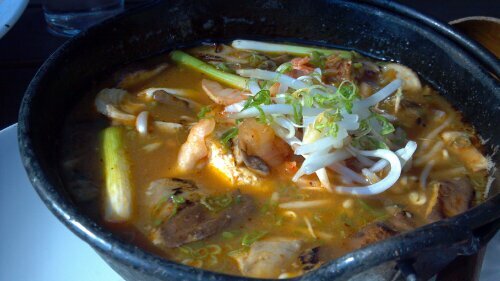 The broth is rich in flavor. Nice and porky but you instantly get that vinegar tang from the kimchee after the red spice driven liquid hits your tongue. The pork is cooked nicely. Great texture. Crispy and fatty with a soft texture within. The noodles aren’t overcooked and there is a plentiful portion of delicious veggies. 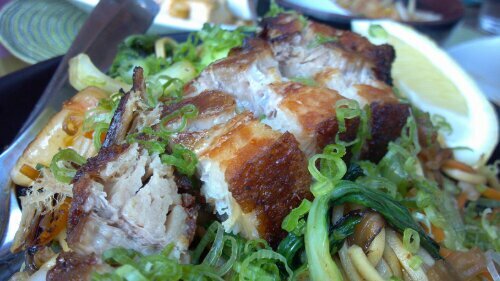 Noodles are almost always on our table when we do Asian cuisine. At Sunda we ordered the Pancit Canton . 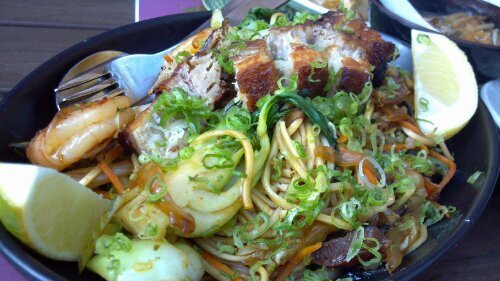 Gorgeous crispy pork, lap cheong, shrimp, carrots, cabbage, and egg noodles. It’s a killer combination of flavors. The presentation is gorgeous and it’s only twelve dollars. Plenty to share. We pretty much ate like kings. We left full and got a great tour of Sunda’s hot side. Call it a day. I hear they also serve a fantastic brunch, so I may find myself at Sunda again soon. In the meantime, I say try those more expensive spots, but don’t go all out. You’ll find it doesn’t need to be a special occasion for you to sample some high end cuisine…and it wont end up breaking the bank. ← #138 – Glenn’s Diner. Fresh Fish and so so much more.